Preheat a griddle to medium-high heat. In a bowl, use a whisk to combine the flour, sugar, baking powder, cocoa powder and salt. Set aside. In a separate bowl, whisk the eggs, then add the milk, buttermilk, butter, vanilla extract, white vinegar and food coloring, whisking to combine completely. Stir the dry ingredients into the wet ingredients, stirring just until combined. Do not overmix. Brush a little butter or spray nonstick cooking spray on the hot griddle, and spoon batter into the desired sized pancakes. Cook until bubbles form in the batter, the edges are dry and the underside is lightly brown, about 5 minutes, then flip over and cook the other side 1 to 2 minutes more. Repeat as needed until all of the batter is used. As pancakes cook, make the cream cheese glaze: In a small bowl, use a fork to stir together the cream cheese, powdered sugar and vanilla extract. Add a little milk if needed to make a glaze that has a thin enough consistency to drizzle. To serve, stack three pancakes on a plate and drizzle cream cheese glaze over them. And i suggest garnish with blueberries,strawberries, or your fruit of choice. 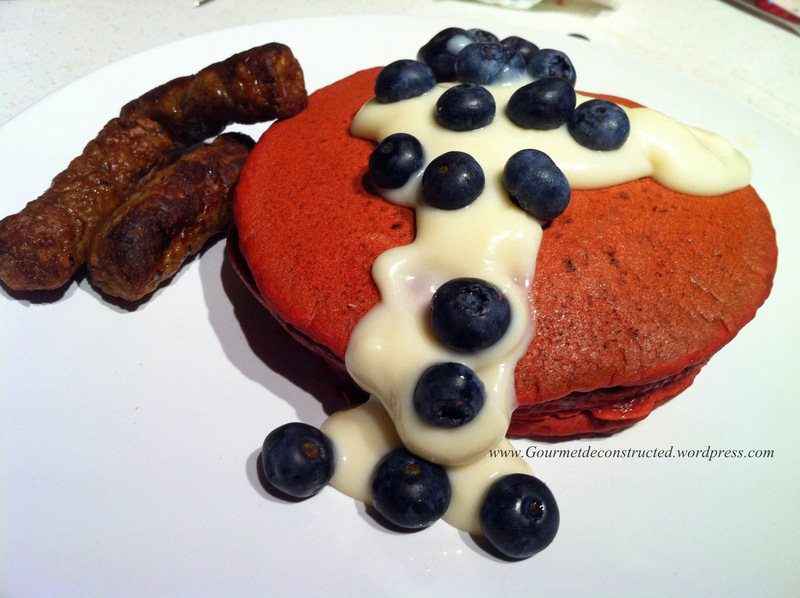 Red Velvet Pancakes De-Constructed, ENJOY! Posted on August 16, 2011, in Breakfast. Bookmark the permalink. Leave a comment.